From views of the Grand Canyon’s staggering drop to the ocean-washed shores of Acadia National Park, the National Park Service for a century has provided citizens from all over the world the opportunity to experience the heart of nature, with a spirit of preservation and conservation at the forefront. Were it not for the eloquent words of conservationist writer John Muir catching the eye of a forward-thinking President Theodore Roosevelt, however, the wonderful monuments, parks, forests, and trails we treasure today may not exist. John Muir at Mirror Lake in Yosemite. Muir dedicated his life to writing about and advocating for natural resources, cofounding the Sierra Club and lobbying for the protection of national parks. His books influenced President Teddy Roosevelt to establish additional national parks, monuments, and federally-protected forests. Photo courtesy of Library of Congress. John Muir began his life on a small Wisconsin farm, but ultimately became famous for his writings on the spiritual interconnectedness of humanity and nature, which were published in major magazines at the time, such as Overland Monthly, Scribner’s Magazine, and Harper’s Magazine. Muir’s more-famous books, such as Our National Parks (1901), My First Summer in the Sierra (1911), and The Mountains of California (1894), caught the eye of President Roosevelt. 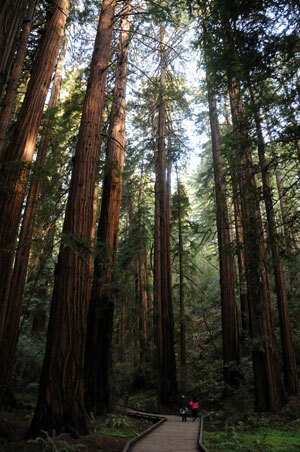 Muir Woods National Monument, named in Muir’s honor, continues to be a testament to his relevance in society today, inspiring others in a spirit of conservation to create a positive lasting impact on the natural world. Photo by Karen Pavlicin-Fragnito. During his presidency, Roosevelt established five additional national parks, as well as eighteen national monuments and more than 100 million acres of federally-protected forests, in addition to being a strong voice for conservation and sustainability. 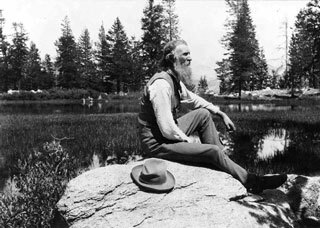 Muir played an active role in conservation throughout his life, cofounding the Sierra Club and lobbying for federal protection of numerous natural sites and watersheds. President Barack Obama continued the legacy of Roosevelt and other environmentally-conscious presidents, using executive action throughout his presidency to protect more than 265 million acres of public land and water, including national monuments, wilderness study areas, and ocean marine reserves. President Obama had vacationed in Yellowstone National Park in Wyoming as a child, fondly referring to it as the greatest experience of his childhood. In June 2016, he visited Yosemite, reaffirming the conviction of the National Park System as “America’s best idea.” As he hiked through the same region of Yosemite that ignited Muir’s and Roosevelt’s passion, President Obama reflected on his experience, noting that nature is a way for families to reconnect with each other and with the world. A painting of Yosemite’s Vernal Falls and Half Dome in the White House West Wing lobby reminds him of his love of nature. To find out more about how you can help with the National Park Service’s conservation efforts today, visit the Centennial invitation or one of the many US national parks or monuments, including Muir Woods National Monument, named in Muir’s honor. The text of John Muir’s books may be found in print form as well as online at the Sierra Club. Select quotations by John Muir. National park history from PBS. Timeline of conservation history from Library of Congress. A high school senior, Alexander Pavlicin is cofounder and copresident of Youth for Sustainable Solutions and serves on his community’s sustainability committee. 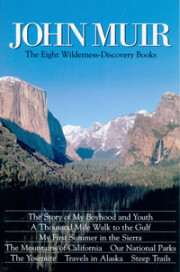 He chose Yellowstone National Park in Wyoming as his first major national park excursion when he was ten years old. 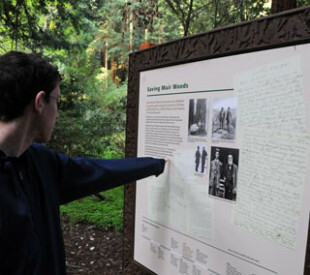 He was inspired to learn more about John Muir and the impact of his writings after a recent visit to Muir Woods in California (feature photo).